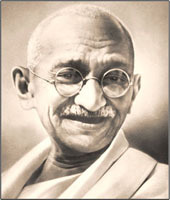 Association of Indians in America South Jersey Chapter (AIA-SJ) runs an essay and art contest annually "Mahatma Gandhi Peace and Harmony Award" for high school and middle school students in New Jersey. The goal of the award is to spread Mahatma Gandhi's message of peace, racial and religious harmony, and tolerance for each other and for each other's culture to New Jersey's school children. The award recognizes New Jersey students that can best use their preferred medium of expression - essay, artwork or poetry/song. All students may submit entries via an application form distributed at the various schools in New Jersey. The deadline for submission of essay, poetry, artwork or song is June 15 every year and winners are announced in September. Application Forms for 2018 contest (both high school and middle school): Download Application. Please print out the application, enter the information neatly, attach your entry, get it signed from your teacher and mail us by June 15. AIA is a national organization. It is the oldest association of Asian Indians in America, having been established in 1967 to help them become a part of the mainstream of American life while being united by their common bond of Indian heritage and American commitment.